Hey there guys! Rukan here, back already with a tournament report and in depth deck analysis of my second place Malamar list from Philadelphia Regionals. I actually posted the core list in one of my earlier articles. And if I may gloat, I made a pretty good and early meta prediction at the end of that article too, hyping both Psychic Malamar and Buzzwole / Shrine of Punishment as top archetypes. Bragging and shilling aside, I already discussed the archetype briefly in the aforementioned article. Today, I want to focus more on the tournament, the metagame, and what I learned from Philadelphia, as opposed to the deck itself, in this particular article. Almost nothing sets up as quickly as Psychic Malamar in this format. This particular Psychic Malamar list can steal games through sheer speed. More search card synergies: Mysterious Treasure and Friend Ball. Mysterious Treasure makes Lillie more productive. Can play both the big OHKO game and the one Prize game. Dawn Wings Necrozma-GX‘s Moons Eclipse enables comebacks in a format without N.
I always want to play the optimal, highest consistency version of any archetype. So, naturally, I ran a bunch of simulations on my Malamar deck. I found that, on average I could get roughly two Malamar out by turn two, and each additional Friend Ball in the list only increased my average turn two Malamar count by about 1% each. At first glance, I thought I did not want to run Friend Ball. However, my simulators only predict the first two turns, and not the course of an entire game. After playtesting, I found that search cards snowball your consistency. Every card you search out of your deck, thins your deck, making each subsequent draw supporter more and more productive as the game progresses. Not to mention, Friend Ball makes it much easier to send Pokemon into your discard pile for Marshadow-GX. And for those reasons, I quickly learned to value search cards highly in a format with so few draw Supporter options. I cut marginal tech cards from older iterations of Psychic Malamar in favor of two Friend Ball, and found great success with my updated list. The moral here is, don’t always rely too heavily on simulation results. The final list runs with, in my opinion, the minimum viable number of tech attackers. Without Professor Sycamore in the format, Mysterious Treasure and Ultra Ball become the only reliable way to thin dead cards from your deck. 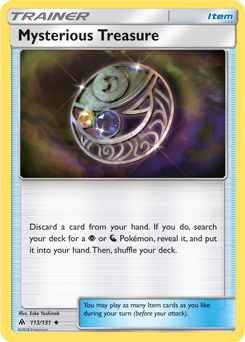 So when you play the deck, you constantly want to search your deck for both useless Pokemon or crucial attackers for Marshadow-GX, and then discard those with Mysterious Treasure or Ultra Ball. Extra copies of Friend Ball make that goal significantly more consistent. Thus, the more tech Pokemon you run, the more search cards you wish you could run. Unfortunately, tech Pokemon use deck slots that compete with search cards. When I look at my Malamar list, I always feel a constant back and forth pull. I want to run more tech Pokemon in my list, but each tech cripples the very engine by which the deck enables its tech options. I believe the list I posted above provides the optimal balance. It gives you as much meta coverage as possible while still fitting in as many search cards as possible. In a format with heavy Shrine decks, Malamar needs one Prize attackers to succeed. Deoxys not only fulfills this purpose, but also serves as a target for Marshadow-GX in the Zoroark matchup. You cannot always find and discard exactly Dawn Wings Necrozma-GX early in the game and you do not want to discard all your Energy by copying Prismatic Burst, as that would make you more vulnerable to Guzma Malamar Knock Outs. Deoxys can still allow Marshadow-GX to KO a Zoroark-GX while only discarding a single Energy. After Philadelphia Regionals, I may even consider a third copy of Deoxys, as two of my three losses came from a shrine deck. Mimikyu swings matchups like Vikavolt / Tapu Bulu-GX, Magnezone / Dusk Mane Necrozma-GX, and Malamar / Ultra Necrozma-GX. I encountered enough of these at Philadelphia to justify a deck slot for Mimikyu. However, I consider all the aforementioned decks suboptimal. I can imagine a world where the meta centralizes more heavily around the decks that actually make Top 8 at Philadelphia, in which case an additional copy of Deoxys makes more sense than a Mimikyu. In short, keep Mimikyu for now, but prepare to remove it if the meta changes drastically from what we saw at Philadelphia. Shining Lugia could help against Dhelmise and other Shining Lugia. Oranguru could help draw cards. And both could help against Hoopa. But, both also require two Energy to retreat, meaning less Escape Board synergy and their Colorless typing also breaks synergy with Friend Ball. So, at the end of the day, I would say I hate them. I want my Malamar list to play like the Zoroark-GX / Golisopod-GX of Malamar variants, able to swing fast and early. Given enough speed and consistency, I believe Psychic Malamar can simply overwhelm any matchup, including ones where my opponent runs robust one Prize attackers such as Dhelmise, Shining Lugia, and Hoopa. Diancie Prism Star lets Marshadow-GX hit for 210 damage using Prismatic Burst. This fixes math against the likes of Golisopod-GX and Lycanroc-GX. This not only saves you a Malamar, but it also saves you the need to draw and discard a fourth Psychic Energy. But when I took Diancie Prism Star with me to a League Cup, I found it useless every single round I played. I cut the card soon afterwards, and do not regret it. I played one Zoroark-GX / Golisopod-GX and two Zoroark-GX / Lycanroc-GX at Philadelphia. I won two of those rounds without Diancie Prism Star, and lost one round to circumstances that Diancie Prism Star could not resolve. I do not regret cutting Diancie Prism Star and intend to secure it in my binder for the foreseeable future. I would conclude that an additional Friend Ball instead of Diancie helps you develop an extra Inkay or Malamar, and Diancie Prism Star serves too niche a role in comparison.